One of America’s newest national parks preserves a huge chunk of the Mojave Desert and old Route 66. 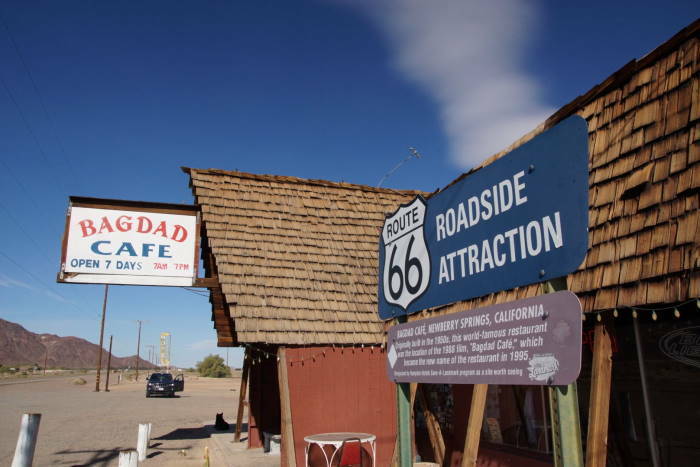 On your way there, you can visit several small communities that dot the map, as well as one very quirky roadside attraction that had a few moments of movie fame: Bagdad Cafe. The Bagdad Cafe is not located in Bagdad, California, as one might expect. 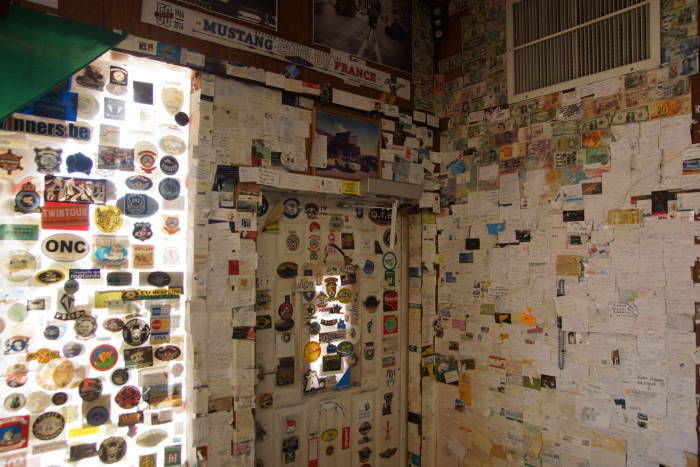 It’s located in Newberry Springs, just off Interstate 40 at exit 18 (18 miles east of Barstow). This is a good place to get off Interstate 40 and follow the Mother Road for a while. Old 66 runs parallel to I-40 Ludlow (Exit 50), then swings south for the drive to Amboy, before returning to I-40 at Fenner and Goffs (exit 107). I hadn’t driven very far on Old Route 66 when I found my first excuse to stop. I love taking pictures of old neon signs like this one, and they are plentiful along Route 66. It wasn’t until I took a few pictures that I noticed what was nearby. The Bagdad Cafe is still riding a wave of fame that came three decades ago. Back in the mid-80’s, this little restaurant was known as the Sidewinder Cafe. But Hollywood decided to call it the Bagdad Cafe, and eventually it changed its name to match. 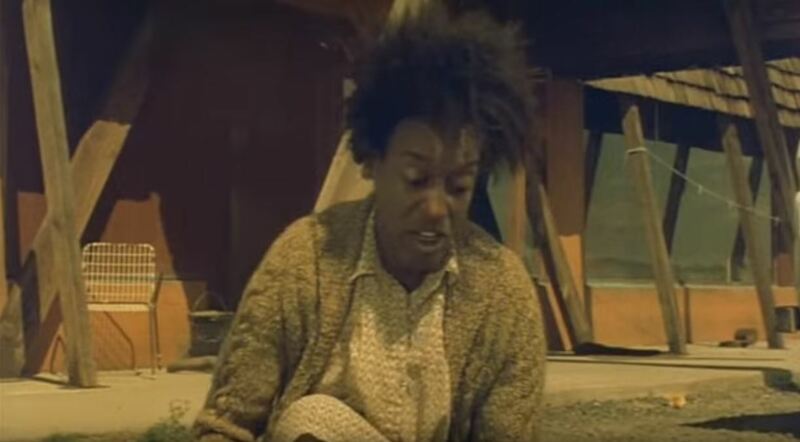 The movie starred CCH Pounder (also seen on ER and NCIS New Orleans, among other shows) and Jack Palance (dozens of films including City Slickers). It centered around the cafe owner (Pounder) and a German woman, stranded in the desert, who formed an unlikely friendship and brought new life to the struggling truck stop. … and the tiny stage at the end of the room. 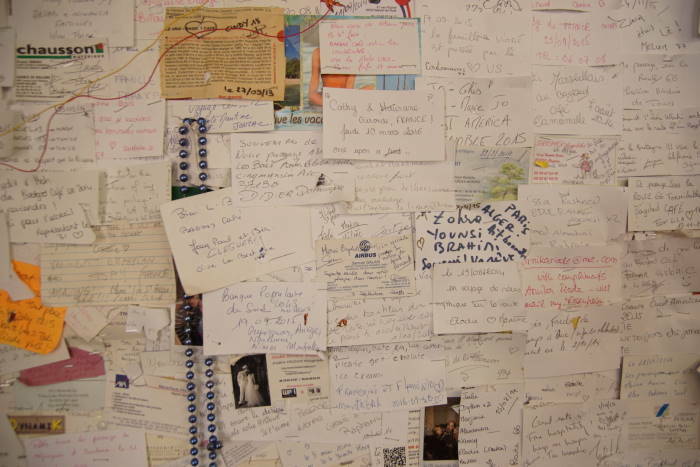 … left behind by visitors who enjoyed their time at the Bagdad Cafe. And of course, there’s a movie poster on the wall. The staff was friendly, and of course there are some souvenirs for sale, so you won’t walk away empty-handed. Back outside, I wandered just a short distance down the street to take a picture of this old gas station, which still has some vintage pumps outside. It also had a tall chain-link fence with several very loud guard dogs on the opposite side, so I’m assuming the owners aren’t interested in capitalizing on their historical Route 66 status. 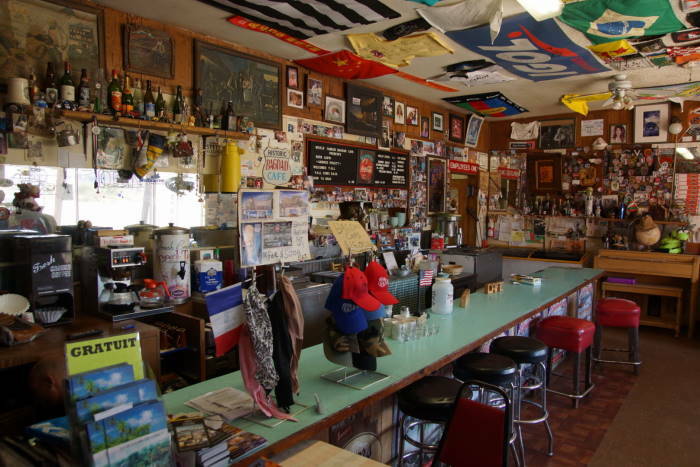 As soon as you leave the Bagdad Cafe, you’re headed into the desolate expanse of the Mojave desert. Just try to imagine traveling this road in the 1920’s or 30’s, perhaps in a Model T.
A few miles down the road, the remnants of an old sign reminds you that something used to be here, maybe a motel. I couldn’t see any other evidence of anything. 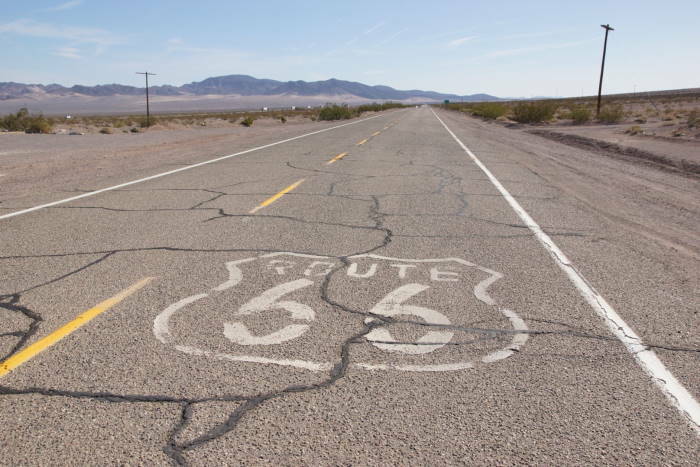 It’s the kind of experience you have over and over again when traveling Route 66 — almost as if you’ve slipped through a rift in time, just long enough to catch a glimpse of what used to be, and then it vanishes. 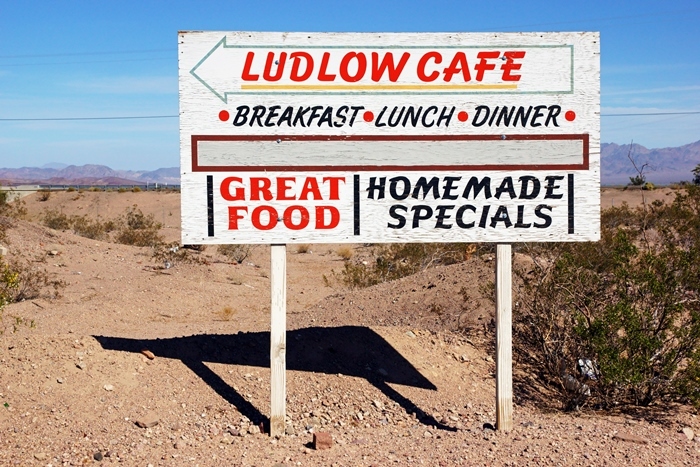 Ludlow is the next sign of civilization along Old 66. Here, you can get on or off I-40. 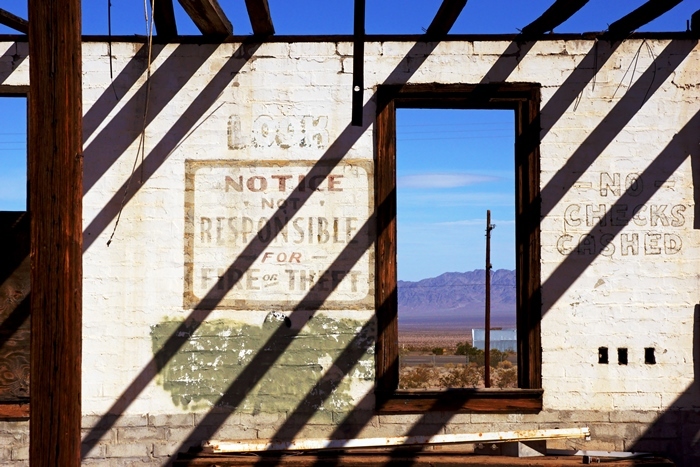 There are a few interesting old signs and abandoned buildings that are worth photographing. If you choose to travel the Mother Road eastbound from here, you’re in for a very long, bumpy, dippy, desolate journey, as the road swings south to Amboy, then back up to the interstate. You might find some expensive gas in Amboy, but don’t count on finding any services for the next couple of hours. I’ll tell you all about Amboy on a separate page. Just a few weeks before my visit in early 2016, President Barack Obama declared this area to be the Desert Trails National Monument. The new park encompasses 1.6 million acres of land, including this stretch of old Route 66. It’s hard to know exactly what will become of this new national park (aside from preservation). As of early 2016, I noticed nothing that would indicate that I was in a national park. A drive down old 66 is a required course for anyone getting their doctorate in roadtrip studies. Take time to enjoy every bump in the road along this stretch. 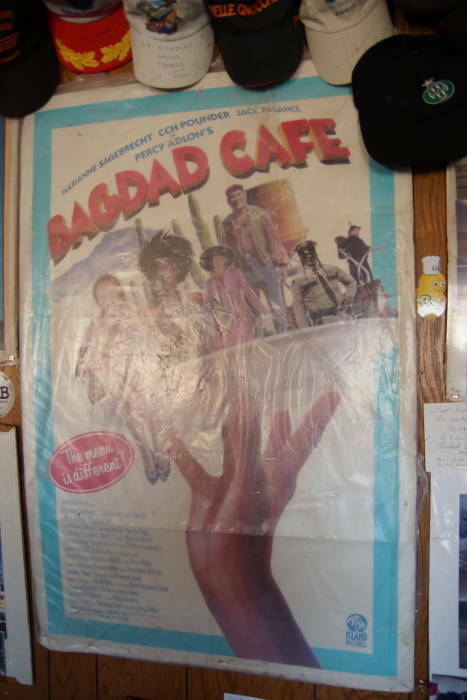 I’d suggest you familiarize yourself with the Bagdad Cafe movie before visiting the actual cafe (at least watch the movie trailer).